After Summer Youth Ranch Conference last month, I was so excited about what the Lord had done, I just couldn’t sleep. I was so wound up thinking about how God’s Grace is so amazing. 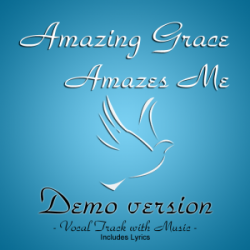 I got out of bed at 1:30 am and wrote this song, “AMAZING GRACE AMAZES ME”. This zip file included a music only mp3, a vocal demo mp3, and a lyric sheet. 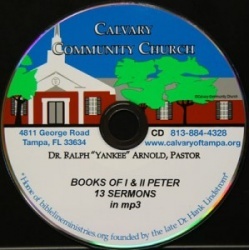 Pastor Arnold's 13 sermon study of the books of I and II Peter. Contained on 1 mp3 CD disc. If you prefer regular audio CDs, please call for pricing. Price includes standard shipping within the continental U.S. Please call for rates to other locations. Pastor Arnold's 27 sermon study of the book of Romans. Contained on 1 mp3 CD disc. If you prefer regular audio CDs, please call for pricing. Price includes standard shipping within the continental U.S. Please call for rates to other locations. It is not cost effective to make, package, and mail a cd for one song, but should you like the song and believe it would be a blessing to give it to someone as a gift, we could send 5 CD’S for $20.00. We invite you to use the download tab and download this song to your computer. We hope you enjoy our song, “We Saw the Rainbow Thru the Rain”. Betty and I enjoyed singing this song together and pray the message will be a blessing to those of you who have spent many years together. In this 3 sermon series, Pastor Arnold gives sound biblical advice on recognizing and dealing with depression. Contained on 1 mp3 CD disc. If you prefer regular audio CDs, please call for pricing. Price includes standard shipping within the continental U.S. Please call for rates to other locations. Pastor Arnold's 8 sermon study of the book of Philippians. Contained on 1 mp3 CD disc. If you prefer regular audio CDs, please call for pricing. Price includes standard shipping within the continental U.S. Please call for rates to other locations. Pastor Arnold's 27 sermon study of the book of Revelation. Contained on 1 mp3 CD disc. If you prefer regular audio CDs, please call for pricing. Price includes standard shipping within the continental U.S. Please call for rates to other locations. In this 7 part teaching, Pastor Arnold clearly explains the true biblical meaning of 7 different scriptures which are often misunderstood by the Christian. Included in this teaching are verses from Hebrews chapters 6 and 10, I John chapter 3, James chapter 2, I Corinthians chapter 6, Matthew chapter 24 and Galatians chapter 5. Contained on 1 mp3 CD disc. If you prefer regular audio CDs, please call for pricing. Price includes standard shipping within the continental U.S. Please call for rates to other locations. Pastor Arnold's 9 sermon teaching on marriage, divorce and raising children and God's views, plans and directions on all of them. Contained on 1 mp3 CD disc. 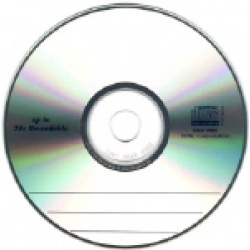 If you prefer regular audio CDs, please call for pricing. Price includes standard shipping within the continental U.S. Please call for rates to other locations. Pastor Arnold's 13 sermon study of the book of Ephesians. Contained on 1 mp3 CD disc. If you prefer regular audio CDs, please call for pricing. Price includes standard shipping within the continental U.S. Please call for rates to other locations. Pastor Arnold's 5 sermon study of the book of Malachi. Contained on 1 mp3 CD disc. If you prefer regular audio CDs, please call for pricing. Price includes standard shipping within the continental U.S. Please call for rates to other locations. Pastor Arnold's 11 sermon study of the book of Galatians. Contained on 1 mp3 CD disc. If you prefer regular audio CDs, please call for pricing. Price includes standard shipping within the continental U.S. Please call for rates to other locations.